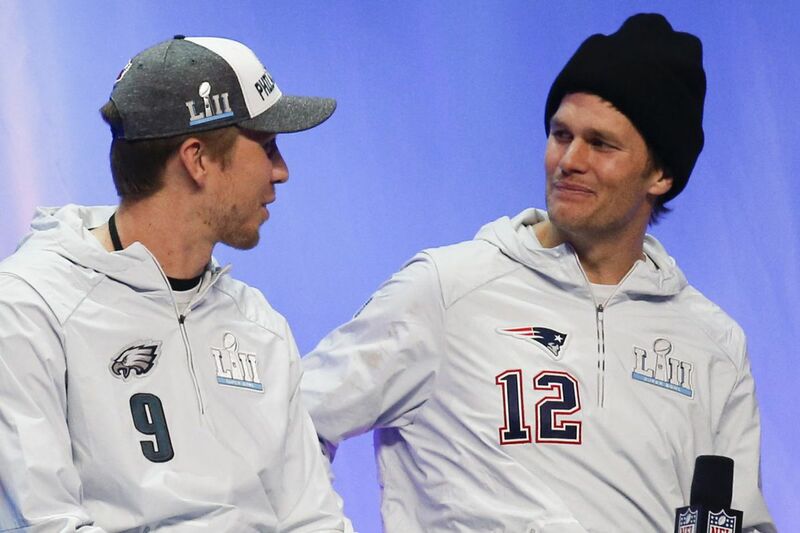 The Eagles and Nick Foles (left) are facing one of the greatest quarterbacks ever in Tom Brady (right) on Sunday. The Eagles finished third in rushing (132.2 yards per game) and fourth in per-rush average (4.5 per carry) during the regular season. They have one of the league's best offensive lines, but the ground game wasn't as good late in the year as it was early. They have averaged just 3.3 yards per carry in their two postseason games. In their last seven games, including the playoffs, they have averaged 4.0 yards per carry, and just 3.5 on first down. In their previous nine games, they averaged 5.2 yards per carry on first down. They have just one rushing touchdown in the last eight games (LeGarrette Blount's 11-yarder in the NFC championship game). Jay Ajayi is an explosive back, who has been most effective early in games. He has averaged 6.1 yards per carry in the first quarter in the Eagles' last seven games, but only 3.0 in last three quarters. Ajayi has a tendency to fumble — seven times in the last two years. The Patriots allowed 4.7 yards per carry this season, which was the second-worst mark in the league, but they held Jacksonville's No. 1-ranked ground game to 3.2 yards per carry in the AFC championship game. Nick Foles struggled in the 10 regular-season quarters he played after Carson Wentz went down. But the postseason has been a totally different story. He had a 122.1 passer rating in the Eagles' two playoff wins and a 155.8 third-down passer rating. The Eagles kept both Atlanta and Minnesota off-balance with RPOs — run-pass options. Foles mostly dinked and dunked against the Falcons, but jr opened things up against the Vikings' No. 1-ranked defense, completing four of five deep throws, including 41- and 53-yard touchdowns to Torrey Smith and Alshon Jeffery, respectively. Jeffery, slot receiver Nelson Agholor, and tight end Zach Ertz combined for 25 touchdown catches, 19 of them in the red zone. Foles has completed 15 of 18 third-down passes in the playoffs. Thirteen of those 15 resulted in first downs. The Patriots have a very good pair of cornerbacks in Stephon Gilmore and Malcolm Butler, and a pass rush that finished tied for seventh in sacks (42) in the regular season and already has 11 in their first two postseason games, including eight against Tennessee. Dion Lewis finally managed to stay healthy for an entire year, and it resulted in a breakout season. He rushed for a career-high 896 yards, averaging 5.0 yards per carry. The Patriots were 19th in run-play percentage (40.8), but they finished 10th in rushing (118.1 yards per game) and 12th in per-rush average. They added short-yardage/goal line backs Rex Burkhead and Mike Gillislee to replace Blount. They combined for 10 of the Patriots' 16 rushing touchdowns, which were the sixth-most in the league. The Eagles allowed seven this season, which was the third-fewest in the NFL. The 5-foot-8, 195-pound Lewis rushed for 90-plus yards in four of the Patriots' final six regular-season games, but he was held to 34 yards on nine carries in the AFC championship game against Jacksonville. The Eagles held opponents to a league-best 79.2 rushing yards per game in the regular season, but they also were run on less than any team in the league (21.1 attempts per game). In their two playoff games, they allowed 4.3 yards per carry on first down. Tom Brady may be 40, but he still is the best quarterback in the game. He proved that once again in the Patriots' comeback against Jacksonville in the AFC championship game, completing 10 of 14 passes for 140 yards and two touchdowns in the fourth quarter against the league's top-ranked pass defense. Brady finished third in passer rating (102.8). His plus-24 touchdowns-to-interceptions differential was second only to Carson Wentz's plus-26. The Patriots had seven receivers with 30 or more catches, including three running backs. Tight end Rob Gronkowski is a matchup nightmare. He had 69 catches, 57 for first downs. The Eagles gave up nine TD passes to tight ends and running backs during the regular season, but just two in their last eight games. The one area in which Brady didn't perform very well this season was on third down. He finished 16th in third-down passing (84.2). Six of his eight interceptions came on third down. The Eagles had 19 interceptions. Nine of them were on third down. Eagles kicker Jake Elliott missed three field-goal attempts from 34 yards or closer and also four PATs this season. Both of Sunday's kickers hail from the same school — Memphis. Eagles rookie Jake Elliott broke most of Stephen Gostkowski's kicking records there. Elliott, who replaced Caleb Sturgis in Week 2, has made 28 of his last 31 field-goal attempts, including 14 of 15 from 45-plus yards. He has had more difficulty with shorter kicks. Three of his five FG misses have been from 34 yards or closer. He also has missed four PATs. The Patriots' Gostkowski owns the league's third-best career field goal accuracy rate (87.7 percent). He's 37 for 40 this season, including 4 for 4 from 50-plus yards. The Eagles had the fewest kickoff returns in the league this season (18), but they should get some opportunities Sunday. Gostkowki is last in the league in touchback percentage (40.8), but the Patriots are third in kickoff coverage (average 18.9-yard return) and third in average opponent drive start off kickoffs (23.3). Eagles punt returner Kenjon Barner had just two returns of more than 8 yards in the Eagles' last 10 games. On Sunday, he'll be going against a Patriots punt-coverage unit that was the league's fourth-best (4.6). The Patriots' Dion Lewis is fourth in kickoff returns with a 24.8-yard average. He returned one for a TD against Denver in Week 10. Eagles DTs Fletcher Cox, Tim Jernigan, and Beau Allen vs. Patriots Gs Joe Thuney and Shaq Mason and C David Andrews: Getting consistent inside pressure on Brady and preventing him from stepping up and avoiding the outside rush will be critical. Advantage: Eagles. Eagles SCB Patrick Robinson vs. Patriots SWR Danny Amendola: Robinson has done an excellent job this season against some of the league's top slot receivers. Amendola is Tom Brady's favorite third-down target. He has six third-down receptions (five against Tennessee) in the postseason, all for first downs. He caught two fourth-quarter TD passes from Brady in the comeback win over Jacksonville. Advantage: Patriots. Eagles SWR Nelson Agholor vs. Patriots SCB Eric Rowe: This is a battle of the top two picks in the Eagles' 2015 draft class. Agholor has had a breakout season. He had eight TD catches and led the Eagles in third-down receptions (22) and 20-plus-yard catches (nine). Advantage: Eagles. Eagles QB Nick Foles: He had a 122.1 passer rating in the Eagles' two playoff wins and completed 15 of 18 third-down passes, 13 for first downs. Patriots WR Danny Amendola: He had 18 catches in two playoff games, including a pair of fourth-quarter TD receptions against Jacksonville in the AFC championship game. Eagles TE Trey Burton: He has just four catches for 36 yards in the Eagles' last five games. Patriots CB Eric Rowe: The nickel corner was targeted six times against Jacksonville and gave up five catches for 69 yards.